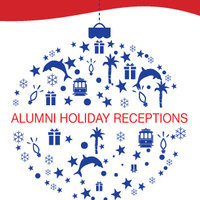 Spread the Gaucho Spirit throughout the holiday season at the 2018 UCSB Alumni Holiday Reception. Holiday sweaters are highly encouraged but not mandatory. Ticket price includes appetizers, a drink ticket, and raffle entry into a white elephant gift exchange. Kids are welcome and free under sixteen years of age. There will be a supervised craft and play area.